This weekend over on Maui, SkateHouseMedia's Matt K will be throwing an epic Downhill Bowl/Slide Phenomenon! 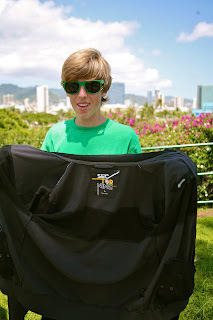 Riders will be bombing from the top of Haleakala summit 30 miles down to an epic backyard pool! With TONS of visitors in town its guaranteed to be full of good vibes. Sadly i did not have the funds to make it over there for the weekend, but not to worry! We got some of the WheelTurnerHawaii crew already over there jamming the waterfalls, so there won't be a shortage of coverage. If you on Maui be sure to check it out on Saturday! 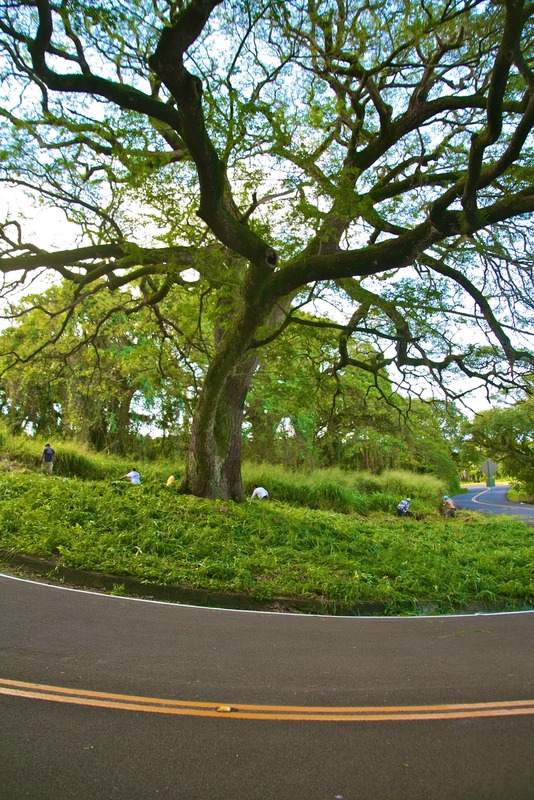 We all love turning wheels in our beautiful state of Hawaii, Its one of the best places for it in the world. Amazing roads, beautiful scenery, a great skate scene, positive vibes... Im sure i speak for everyone when i say we don't want to mess this up. After all Hawaii has VERY close connections to the sport of Downhill Skateboarding and its roots... so we must practice the sport safely and properly to make sure our state continues to allow us to turn our wheels. 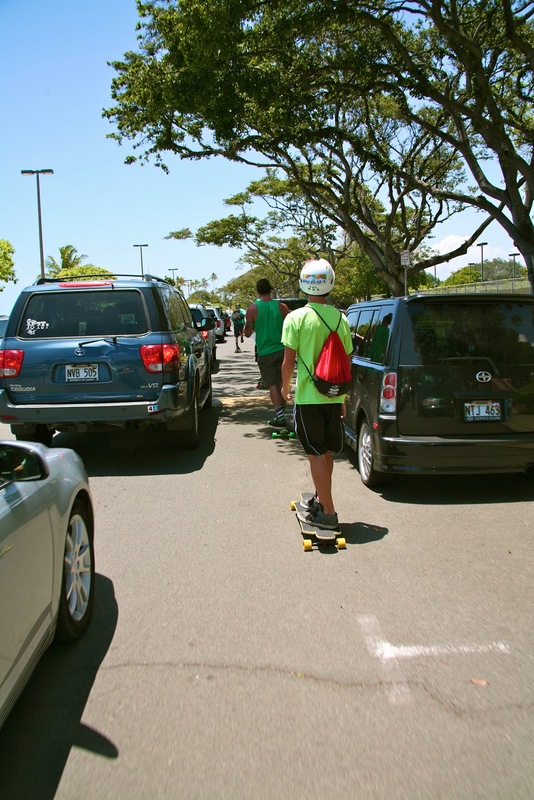 These aren't rules, if you don't follow them you will not receive any punishment for it ( well the cops will tag ya for a few )... these are just guidelines put together to help new skaters to the scene learn proper Hawaii skate etiquette. The more knowledge we spread, the more educated the public will be on our sport. 1- ROLL WITH CONTROL. Skate within your limits and ALWAYS be aware of your surroundings weather it's the hills conditions, other skaters or even machines. 2- ALWAYS WEAR YOUR PROTECTIVE GEAR. Wear AT LEAST your helmet and gloves every time you skate down a hill, no matter how comfortable you are on it. ANYTHING could happen. The more hurt skaters there are going to the hospital, the more people frown upon it. Not only is it good for your own personal safety, it shows others that we aren't trying to be reckless. With proper protection it helps show that the sport you are into is legit, not just some new dare devil stunt you and your friends made up. You'd be amazed on how much a reaction from someone can change when they see you are taking the time to protect yourself and do your hobby safely. 3- YELLOW IS LAVA. NEVER pass the middle line on the road. The uphill lane is NOT for apexing turns, it's for cars driving in the opposite direction as you. Even if you think its clear, don't make the habit of doing it. IF you can't make it down a hill without staying in your lane only, hold off on skating that hill. 4- BE RESPECTFUL TO THE MOUNTAIN AND THOSE WHO ARE ON IT. Always have a smile on your face and throw up a shaka. We don't want to fall into the "skater punk" stereotype. If you see residents who live on the hill... nicely greet them. Show them that you appreciate them not tripping out on you skating their home hills. But even if they do get upset, Smile and Shaka! Its also important to PICK UP YOUR TRASH. Leave the mountain looking better then it did when you first got there. 5- BE NINJAS, NOT PIRATES. Self Explanatory. 6- SCOPE BEFORE SESSIONING. There could be a number of things on the road that could totally ruin a run for you. Unseen wet spots, branches, cops, glass, ect could instantly turn a RAD run to a CRAPPY one. Check out the road you are about to ride and its conditions before mobbing down it. 7- CLAP YO HANDS! Clap your pucks together to inform your friends about possible incoming hazards such as cars, walkers, bikers, debris, ect. 8- COMMUNICATE! Always keep good communication while riding in a pack. Make it known when you are making a pass... even better, inform the rider in front which side you will be passing on. If you are the rider in front, you see whats coming first. Inform the following riders of any hazards, and if you need to make a quick, unpredictable maneuver... try to signal where you are going to help avoid possible collisions with passing riders. 9- KEEP QUIET DURING DAWN AND DUSK. Be curtious to the residents of the hills that you are riding. If you skate in the early mornings or at night, keep the noise down. Avoid using your pucks as much as possible, and keep the stoked shouts to a minimum. 9.5 - LIGHTS AND HI VIS! If you do choose to skate during dawn or dusk, ALWAYS use a front and rear light. It also dosent hurt to use a reflective vest. If you don't like headlamps because they throw off your vision, use a low light blinking style bike light. You NEED to be seen, no matter how good you can see. Machines are dangerous, ESPECIALLY at night. 10- CHILL OUT! ITS NOT A RACE. While riding with friends do we really need to prove who's the fastest? Don't race down the hill while crusing with friends. If its a sketchy spot/situation to make a pass, don't contribute to the sketchiness... foot break or throw a slide and wait for a good, safe time to make the pass. If the gap doesnt open... no biggie. Start in front next run and take it at what ever pace you want. 11- IF SOMEONE GOES DOWN, HELP EM OUT. If a homie in the pack goes down, check up on them... no matter how sick the run is. Even if it's a minor spill, check to make sure they can make it down the rest of the run. 12- COLORS- Matching colors make you faster, by at LEAST 5mph depending on how matching you are. For example. Having wheels that match the deck, that match the grip tape, that match your socks that match your helmet, that match your watch, will make you first down the hill... No questions asked. 13- SKATEBOARD EVERYTHING. Do an Ollie, maybe even a kick flip! Make an effort to skate all types of terrain. This will help you in avoiding any danger while skating down a hill, no matter what the situation is. 14- DONT BLOW SPOTS. We want to keep skating the zones that we love. Im not saying keep them secret, but don't title every video you make by the hill name. Kooks will see that and say " that looks fun" and go straight to blowing your zones. Make up nicknames for the spots! Use random names for video titles... NEVER PUT A HILL/STREET NAME UP. 15- LEARN TO RIDE A SKATEBOARD BEFORE YOU LEARN TO RIDE A HILL. 16- If you skate more on camera than you do off camera, your doing it all wrong. 17- ALWAYS SKATE AT 60% OR UNDER ON AN OPEN ROAD. Though this rule is similar to rule 10, i can't say it enough. You aren't racing every run, you are not constantly going for that video banger... so RELAX! Not every corner needed to be hit full speed every time. I know how much fun it can be to hit some of your favorite local runs at 100% every run but it really isn't worth it on our busy Hawaiian roads. Have fun and soul carve... maybe even ride a different set up that adds a little challenge while getting down the hill so you aren't tempted to go too hard. 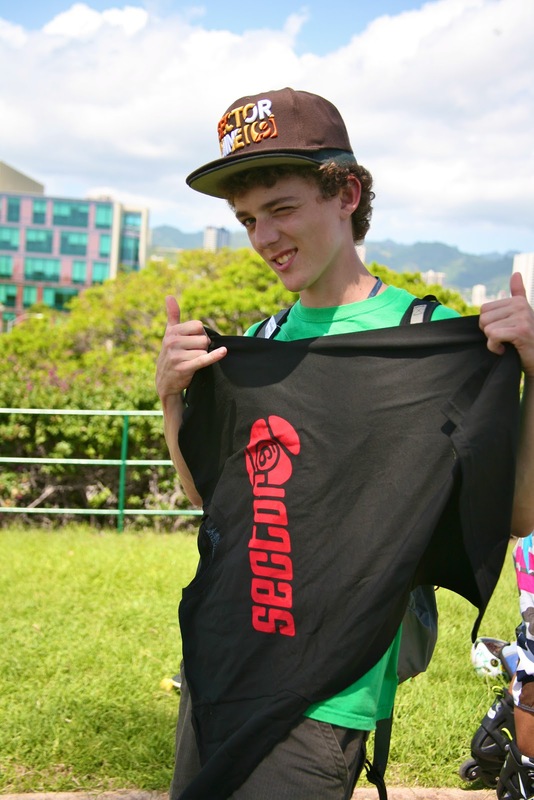 Now please take a few minutes to go over the state guidelines to skateboarding in Hawaii. I recommend having a copy of the laws on you at all times, the Honolulu Police Department is known to give the wrong tickets for this which could cost you $100 more then you should be paying! Im more then STOKED that the University of Manoa finally has a skate club together! Its been a dream of mine for years, but impossible to accomplish since i don't do that college stuff. Jennifer Reiss has been heading the club and is doing a good job of getting people amped. Scope this video from their last campus bbq. Slide jams, slalom, and food! Prime. I hope i don't work next time! Who wants to see this race make a comeback? I do! Fast, wet, sketchy,waterfall awards, INVITE ONLY... winnahz. Heres some good ole outlaw racing from 2009. 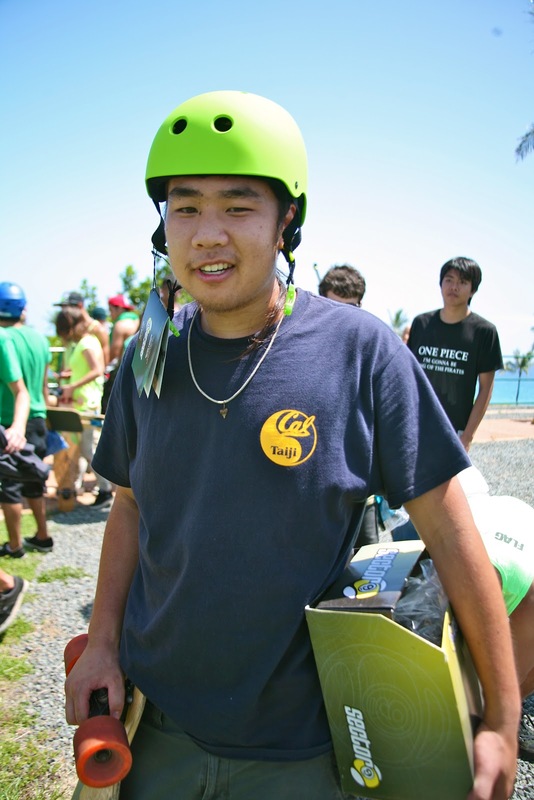 It's April, and once again the Green have gathered on the South side of Oahu for the 4th Annual Green Skate Hawaii. Nearly 50 amped wheel turners showed up on a sunny Saturday, the 26th of April to push from UH Manoa to Kakaako waterfront park. All kinds of wheels were at Green Skate. 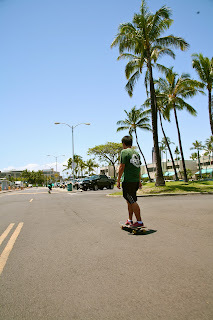 To help the public see that a Skateboard is a great alternative energy mode of transportation... especially in this area of Hawaii. We also picked up the trash along our skate to keep the community that we skate in clean. But its also a fun skate, with a rad crew... nothing but stoke! Once the crew was assembled, trash bags were passed out, the route was explained, group photo taken... then once the stop light matched our shirts, we started our bomb down University! This is always the best part! Everyone is still in a big group and this is the only hill along the whole route, which makes for a SICK pack bomb of madness. Cars can never help but to give into the stoke and let us roll as a pack down this hill... its a beautiful thing! KJ reveals a ball of Nectar to Rhys... who needs an energy drink? UH Manoa " Wahines on Wheels" skate club leader looking back at the pack. After the bomb, its flat till the end. Some choose to cruise and take a mellow pace, others skate the obstacles all along the route turning it into a street sesh, and a few race for the finish through traffic. Whichever line you choose theres skaters all around amping you on, so it makes the push seem not nearly as long as it really is. Finally after working our way through the hectic area of Honolulu/ Waikiki we hit the home stretch, Ala Moana Beach park. The busy roads are done and in here we can relax for the final push along the beach. A skater grabbing that trash along the push. Every year we get to Kakaako and realize how fast it was to get there! We coulda pushed slower and stopped for water! But I'm sure everyone was rushing for the prize giveaway at the finish. 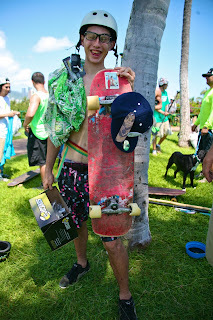 Thanks to Sector 9, DaStickHonolulu, and WheelTurnerHawaii.com we had all kinds of skate goods to give away. Prizes were given away in all kinds of ways. 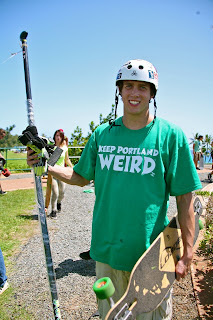 Skate limbo, a slide jam, Grass hill races, most trash picked up, fastest pusher, slowest pusher... All kine! After the festivities were done, EVERY RIDER IN ATTENDANCE went home with a prize. Getting awarded for having fun! What could be better! Good times, Great Vibes... Cant wait for next years Green Skate Hawaii. 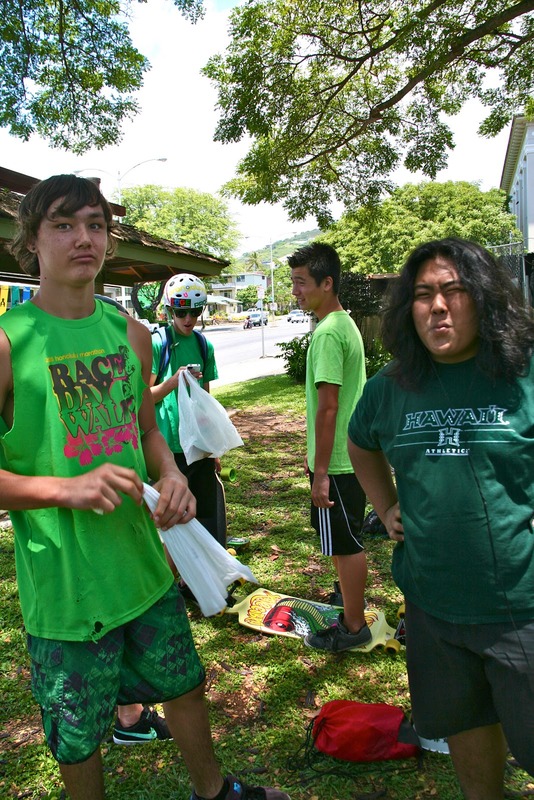 Big Mahalo's to everyone who came out to roll Green Skate. I hope everyone had a good time!